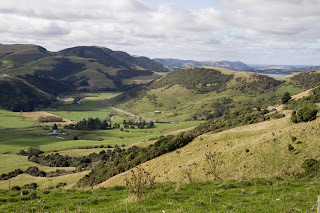 Beautiful ride through the Catlins to Invecargill. C=9,R=7,T=2,V=7. Had a couple of Jimmy’s pies along the way and they are good. Too bad I couldn’t have made it to the factory in Roxborough to shake hands with Jimmy! Avoid mutton pies. 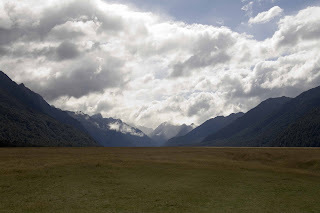 Invercargil to Te anau was smooth and fast (fast for NZ roads is 110kph, which have no shoulders at all). C=7,R=7,T=1,V=8. 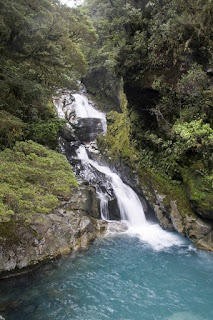 Out to Milford sound which started as a good day, but sat in rain for the majority which you do in Milford sound. Road was outstanding. C=8, R=8(for NZ standards),T=2,V=8. 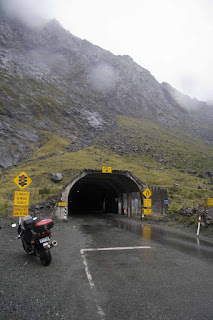 The Homer tunnel was a highlight which has a major decline in a poorly lit one lane through a mountain pass. Could only get a photo on the out side of the tunnel. Managed to pay $2/liter for gas and met Bruce from the Faroe Islands (only 50,000 people, like meeting someone from Prince Albert, Saskatchewan in South America). Lake front backpackers wanted $3 flipping dollars for a spa!! !